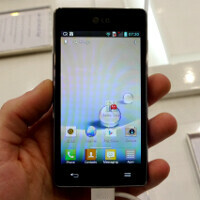 The LG Optimus L5 II is among the newest members of the company’s L-series of Android smartphones. And as you might expect given its model name, the handset comes with specs that make it more capable than the Optimus L3 II, but inferior to the Optimus L7 II. There’s a 4-inch touchscreen gracing the front of the LG Optimus L5 II, and its resolution of 480 by 800 pixels is okay considering its size. We’re happy to see that the panel is of decent quality as it exhibits good viewing angles and represents colors pretty accurately. With its 1GHz single-core processor, the LG Optimus L5 II won’t set any new performance records but the MediaTek-made SoC should adequate for every-day use. Android 4.1.2 comes loaded on the device out of the box enhanced using LG’s custom Optimus UI user interface, and it moves quite smoothly powered by the MTK chip.